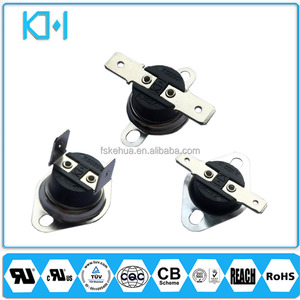 We are engaged in producing rocker switches and etc. We greatly appreciate your positive feedback and will do the same. We are sincerely looking forward to establish cooperative relationship with you. 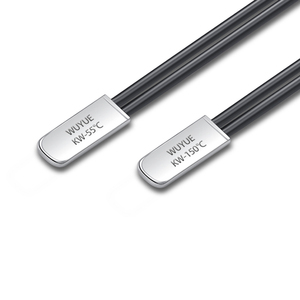 8)Insulation resistance&ge;100M&Omega; 9)Control type: mechanical temperature controller 10)Contact resistance:&le;50M&Omega; 11)Operating life: &ge; 100,000times 12)Certification: CE and CQC 13)Used for electric water heater, washer, electric oven, fried pan and refrigeration industryetc. 14)Manufactured on customers' request 15)Warmlly welcome to contact us at86-15957748531 Attentions 1, The whole bulb is supported closely aligns controlled temperature surface while thermostat installation, to achieve accurate temperature control purposes. 3, Don't make electricity gas and electricity material in a thermostat or contaminated thermostat surface to avoid affect the electrical insulating performance. This can be divided into 7 sub-series: KSD301,KSD301R,KSD301G,KSD301GR,KSD301-SG,KSD301R-M,KSD301,GR-M SAFETY CERRIFICATE Type Max. Operating values Rated vlotage Rated current Life KSD301 SERIES 185&#8451; 250VAC 5A,10A,16A 10,000 cycles KSD301R SERIES 185&#8451; 250VAC 5A,10A,16A 10,000 cycles KSD301G SERIES 270&#8451; 250VAC 5A,10A,16A 10,000 cycles KSD301GR SERIES 270&#8451; 250VAC 5A,10A,16A 10,000 cycles KSD301R-M SERIES 185&#8451; 250VAC 5A,10A,16A 10,000 cycles KSD301GR-M SERIES 270&#8451; 250VAC 5A,10A,16A 10,000 cycles UL CERRIFICATE Type Max. Operating values Rated vlotage Rated current Life KSD301 SERIES 150&#8451; 125VAC 5A,10A,16A 10,000 cycles KSD301-R SERIES 150&#8451; 125VAC 5A,10A,16A 10,000 cycles KSD301-G SERIES 240&#8451; 125VAC 5A,10A,16A 10,000 cycles KSD301-GR SERIES 240&#8451; 125VAC 5A,10A,16A 10,000 cycles KSD301-SG SERIES 160&#8451; 125VAC 5A,10A,16A 10,000 cycles Dimension of bimetal thermostat Terminals and covers( COVER CODE AND THER SKETCH ) THERMINAL *TERMINALS AND COVERS OF BIMETAL THERMOSTAT CAN BE CUSTOMIZED UNDER YOUR REQUEST. 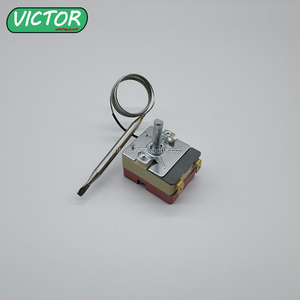 Suitable for direct insert steam control of electric kettle . Q: Do I need to pay for the sample9 A: No ,We will send the samples by your DHL,,UPs ,Fedex account. Q: How long will I got the sample9 A: It need less than 2-3 days. 4. Prompt delivery 5. Pls contact us for more information. Our advantage: 1. 20 years production experience. 4. Prompt delivery 5. Pls contact us for more information. 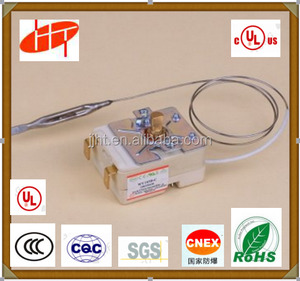 4 YRS Guangzhou V.Crown Thermostat Co., Ltd.
2. Q: Can you customize as per my sample or drawing9 A: Yes, we can customize as per your sample or drawing. 5.Q: How do you pack the goods9 A: Our standard packaging is carton, we can customize it as per your requirement as well. 6.Q: How do you ship the goods9 A: We can ship goods by sea or by air, the nearest port is Ningbo & Shanghai. 120/250 16 WP-5E -2 -5 --- --- 12 7 800 S.P.S.T. 120/250 6 WPF-5E -2 -5 --- --- 12 7 800 S.P.S.T. 120/250 6 WR-30 15 18 --- --- 27 30 240 8-100 S.P.S.T. 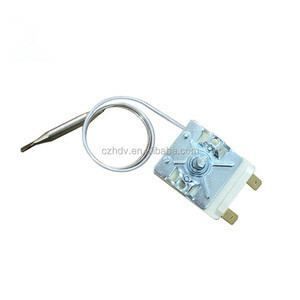 Single-Pole Ego Thermostat for Water Cooler The Capillary type Ego Thermostat shown in the picture is for various water coolers and water dispensors. The model Ego Type Thermostat is rated at 16 amps-250 volts, approx dimensions of capillary thermostat body is 35mm wide x 43mm high x 28mm depth fixed with two screws at 28mm hole centers, standard capillary length is approx 1000mm (300-3000mm optional), sensing bulb size is available on 3mm, 4mm, 5mm, 6mm. Single Pole Single Throw and Single Pole Double Throw is available according to the various applications. 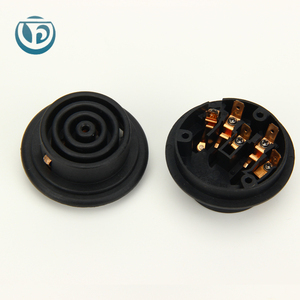 Shengda Ceramic can supply and customize the steatite ceramic insulator products according to customer's drawings, samples and performance requirement. C221 T hermostat Ceramic Base is mainly used for T hermostat Porudcts . We have following dimension of T hermostat Ceramic Base . 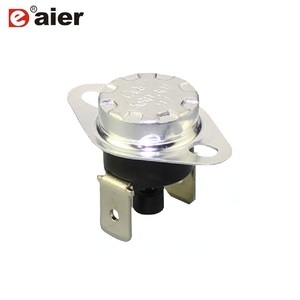 Alibaba.com offers 482 ego thermostat products. About 11% of these are other home appliance parts, 8% are temperature instruments, and 1% are electric water heater parts. A wide variety of ego thermostat options are available to you, such as free samples. There are 482 ego thermostat suppliers, mainly located in Asia. 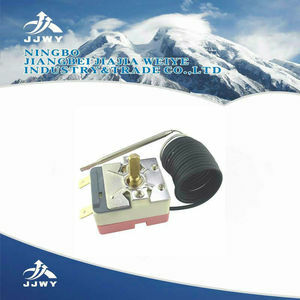 The top supplying country is China (Mainland), which supply 100% of ego thermostat respectively. 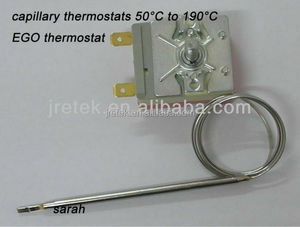 Ego thermostat products are most popular in Southeast Asia, Mid East, and Africa. You can ensure product safety by selecting from certified suppliers, including 212 with Other, 36 with ISO9001 certification.